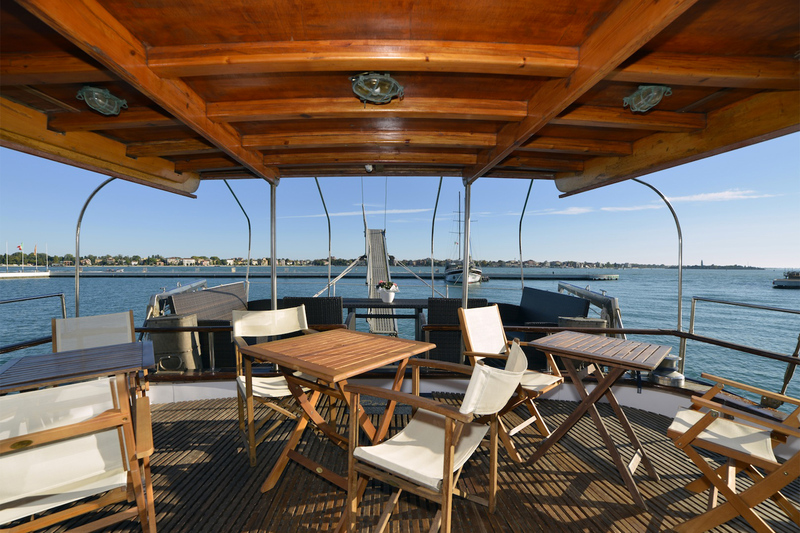 The boats have cabins divided into twins, triples and doubles for a total of 16 cabins. 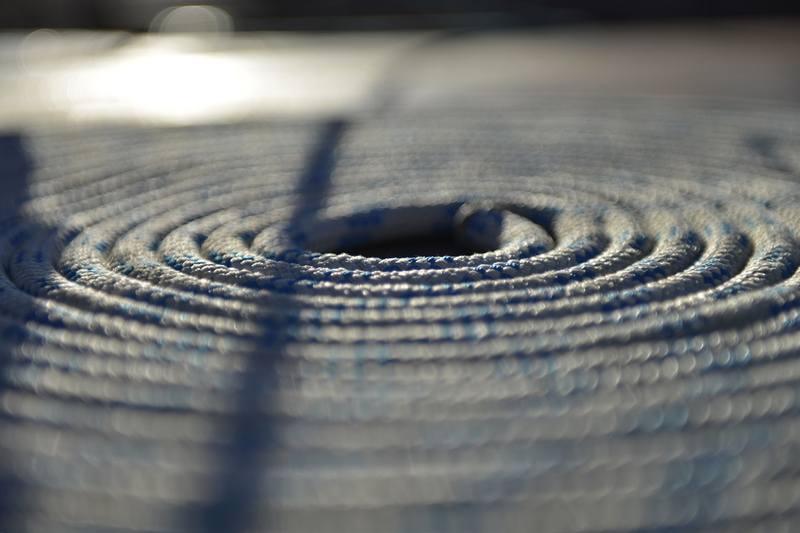 All cabins are equipped with heating and cooling, private bathroom with free toiletries and towels for each guest. 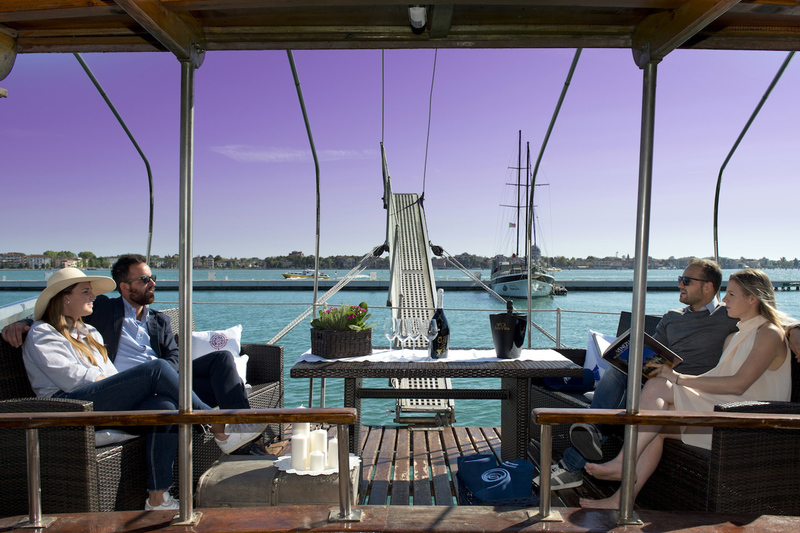 We also offer a sun terrace on which you can relax, enjoy a glass of Prosecco in the calm and peace of the Venetian Lagoon. 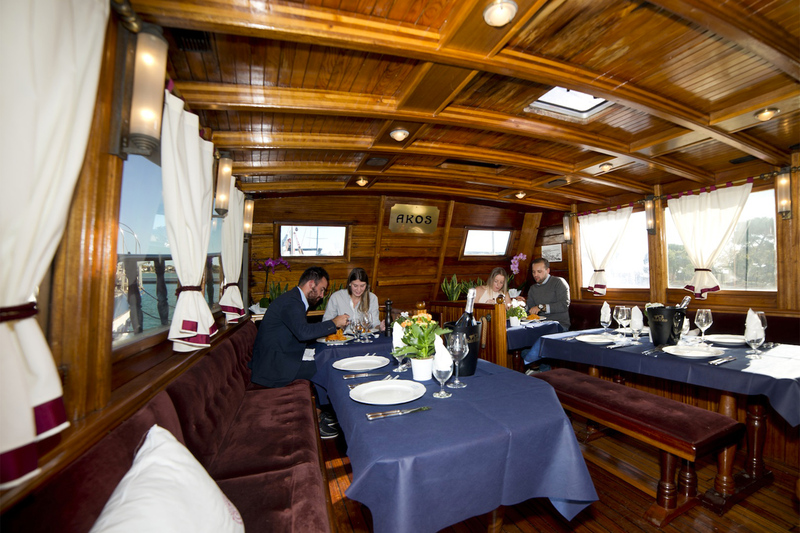 In the common areas we find a large entrance where you can sit especially during the coldest or rainy days, converse sipping some hot drink wrapped in the magical and unique atmosphere of a Gulet. 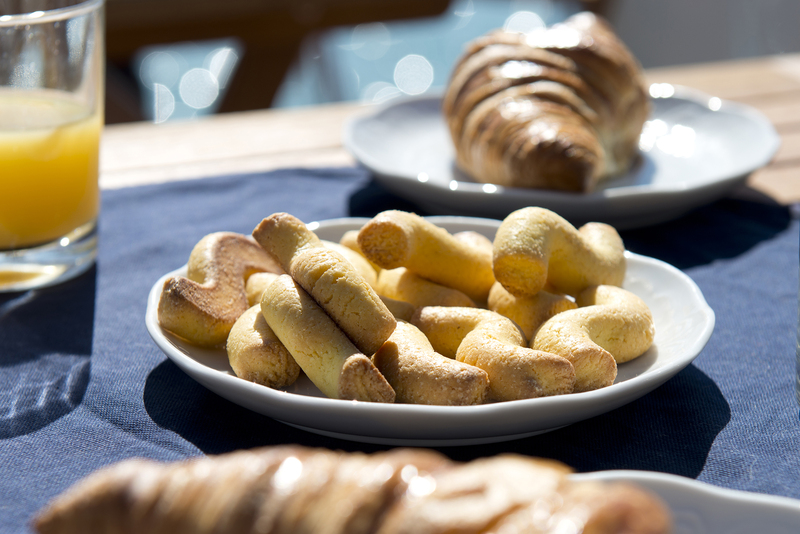 The sweet breakfast with hot drinks, juices, baked goods, fruit and yogurt awaits our guests from 8.00 am A.M. 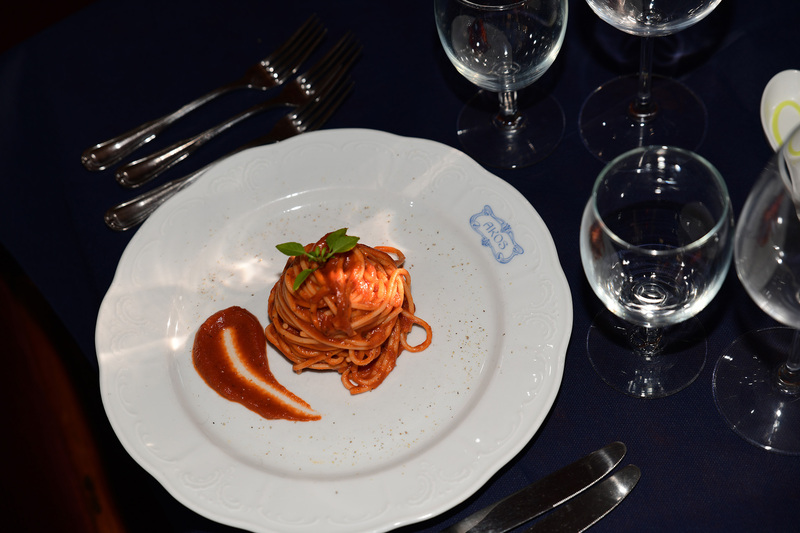 While visiting Venice our goal is to really make your holiday a unique and satisfing experience! Purchase tickets for concerts and events. Print airline tickets, trains, buses. Flowers and / or bottles with room service. Are you traveling with your pet? No problem! 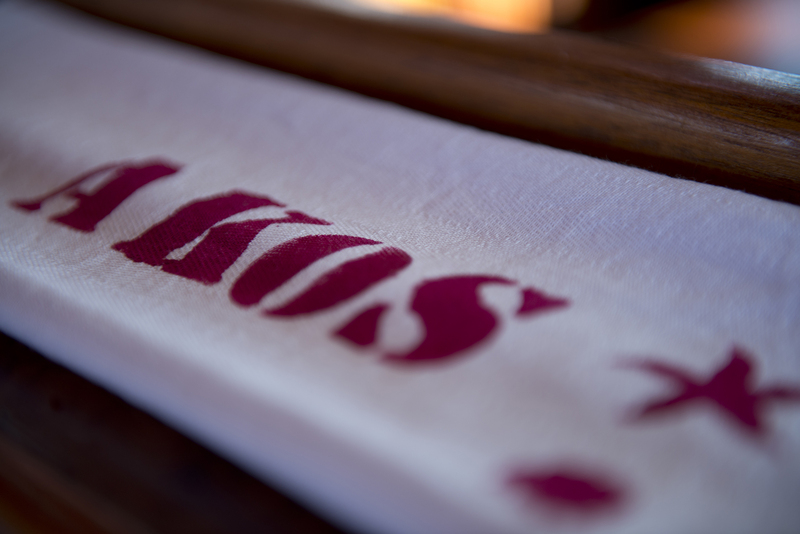 Your little friends are welcome inside the Gulet Akos. 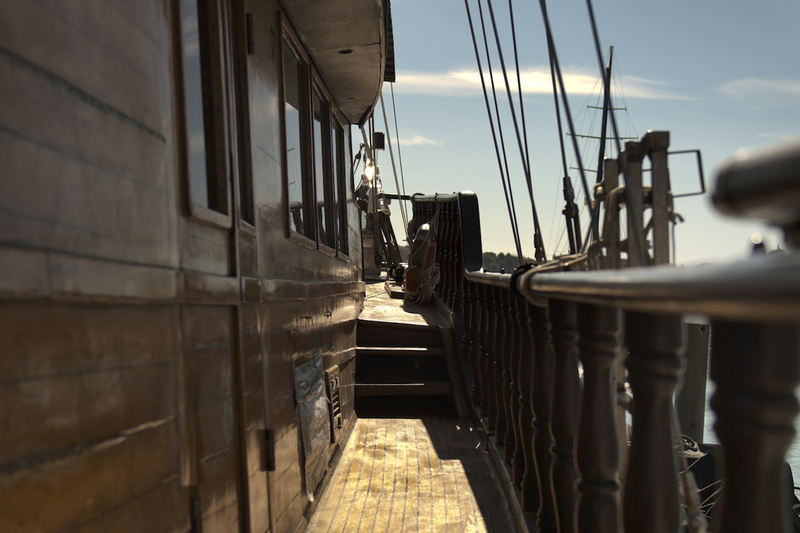 However, being a boat and not a hotel, we ask you masters a certain respect and attention to both the animals, and the other guests on board in order to avoid unpleasant incidents. 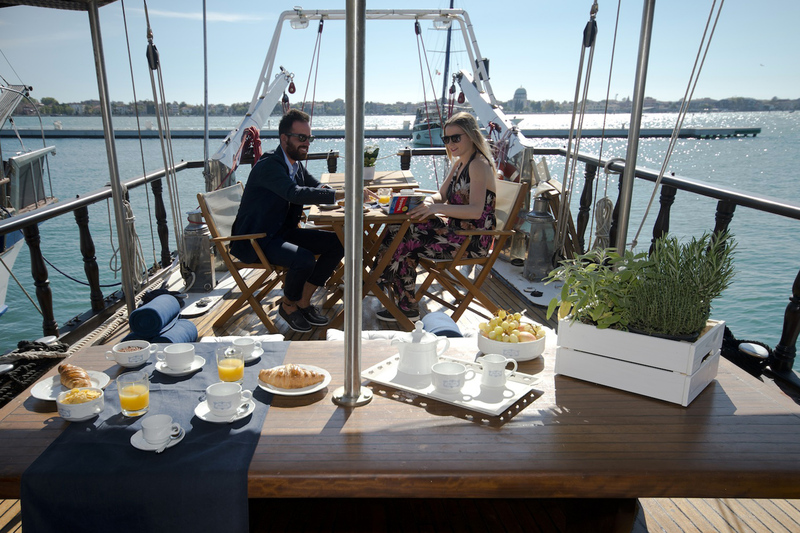 Free Wi-Fi is available for guests in all cabins and common areas of the boat. 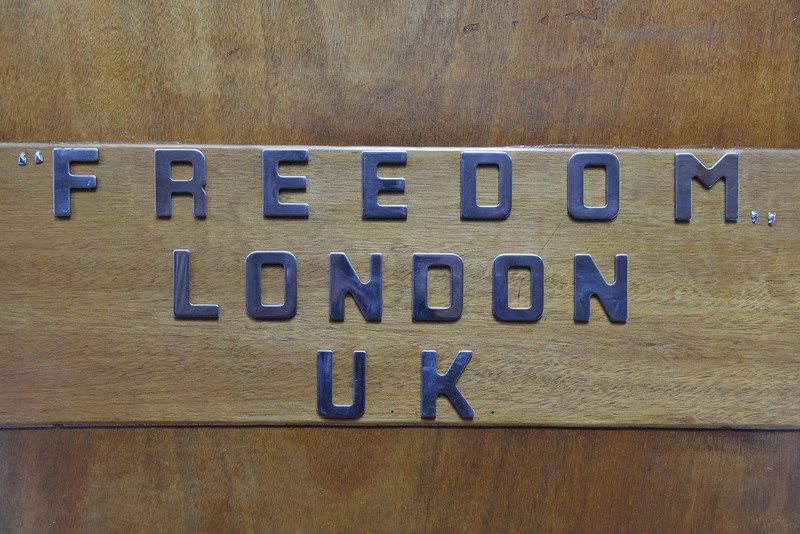 The access key is available to you at check-in at the front desk. 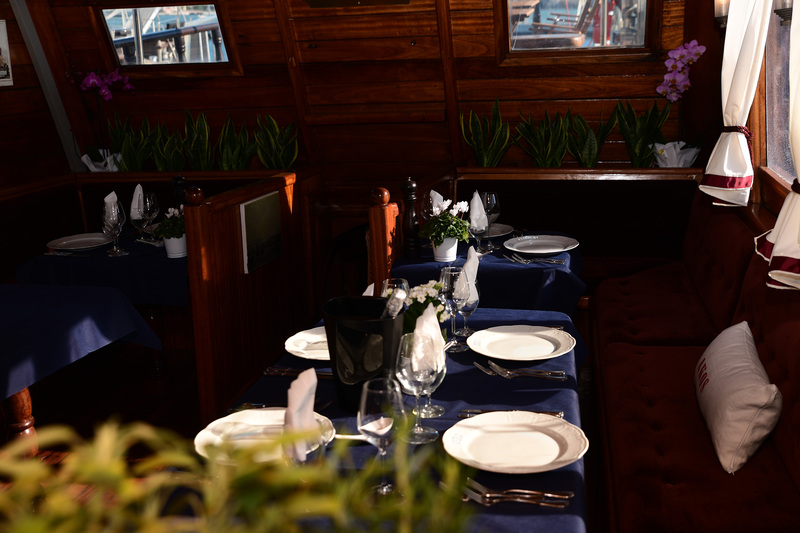 Enjoy the spectacular dinner on board served by our chef every night starting at 20:00. 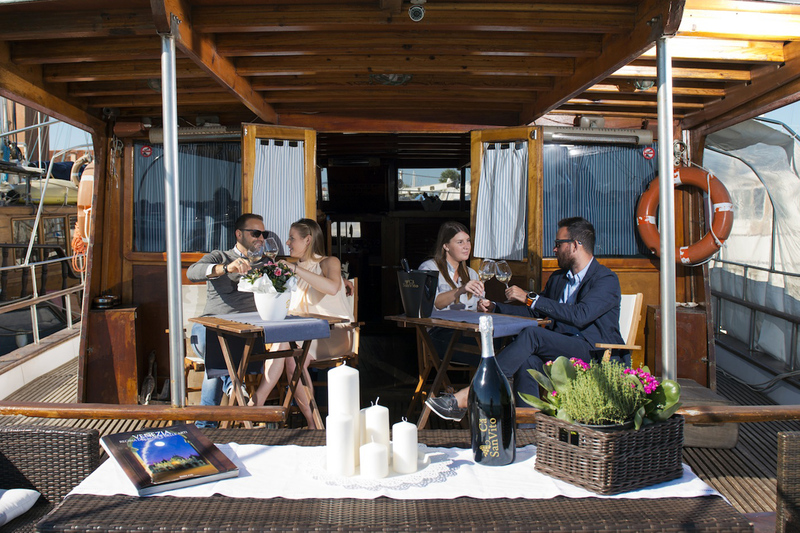 Sitting next to the water, with a fabulous view, drink a glass of Prosecco and taste the typical “cicchetti” finger food and traditional dishes of Venetian cuisine. We organize your confortable transfer to and from Marco Polo airport. 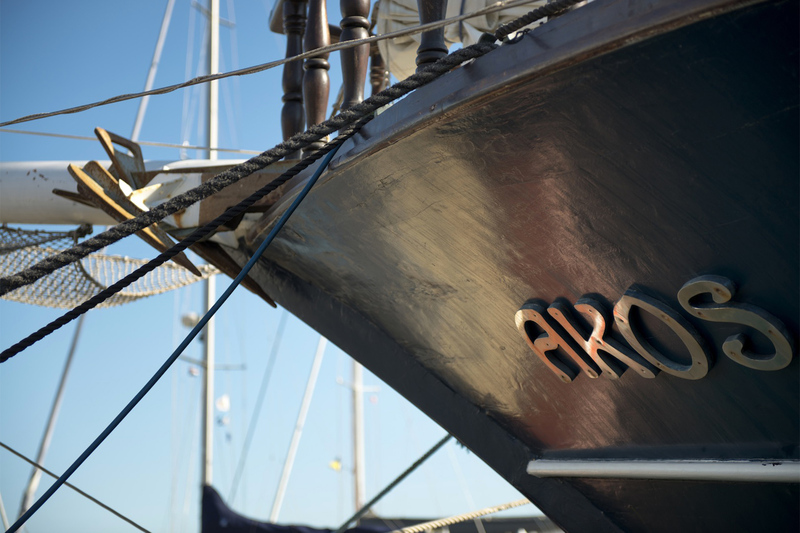 Save time and money by using our direct transfer service from Marco Polo airport to the dock of our Marina. We are at your disposal to book a shuttle (24/7) to reach the Marco Polo Airport of Venice in just 25 minutes and without any additional transfer. We recommend booking the service in advance. Luggage storage outside the cabin before check-in and after check-out is allowed and completely free. In the event that there is a need to keep packages, items of particular value and / or size, we kindly ask for a 24-hour notice from the date of check-in. In the event that guests should receive mail and / or boxes at the property, the following wording is required in the space of the destination: “MARINA SANT’ELENA – STAR SAIL Srl – GUEST NAME RECEIVER”.